HOTEL KAATERSKILL,N. 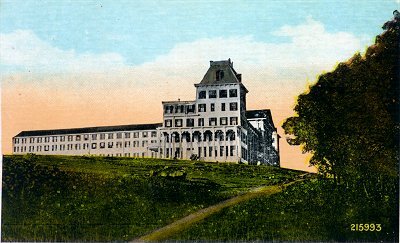 Y. Aug. 12.- At 10 o'clock to-night the Opera House adjoining the Hotel Kaaterskill was the scene of a brilliant and fashionable gathering in honor of President Arthur, a ball being tendered by Mr. George Harding. This was the crowning event of the present season. The costumes worn by the ladies were magnificent, while their jewels sparkled at every turn. President Arthur entered the room on the arm of Mr. Harding, followed by the other members of his party. Miss Nellie Arthur, attired in,vhite, was escorted by Gen. George H. Sharpe, who had returned from Kingston last evening to be present on the occasion. The Germania orchestra, of Philadelphia, furnished the music. Among the guests were Chief Justice and Mrs. Waite, Secretary of State Frelinghuysen, Mr. and Mrs. Alexander Brown, Mr. George Harding, Miss M. G. Frelinghuysen, and Mr. Butler Harding. The President and his party visited the Overlook Mountain House to-day, where they were received with firing of cannon and hurrahs by the multttude of people who gathered on the hotel veranda. A banquet was served there, after which the party visited the principal points of interest. On their return they were saluted along the route by thousands who had gathered to catch a glimpse of the President. On one or two occasions the President was presented with bouquets by young ladles, which he received with many smiles and profuse thanks. On reaching the hotel he partook of dinner and immediately dressed for the ball. Mr. Fred J. Phillips, the President's private secredary, left to-day for New York. THE YOUNG AND OLD CONTRIBUTE TO MAKE IT A SUCCESS. HOTEL KAATERSKILL N.Y. July 2.- The grand opening ball at the Hotel Kaaterskill this evening was a brilliant success. H.K. Carpenter and H. P. Burney, the managers this year, have opened the Hotel Kaaterskill with more guests booked than at any other time so early in the season. They are driving business with energy to make this the banner year. The bugle call at 8 o'clock was a signal for the children to open the ball. The room was decorated with flags and gay bunting. For an hour the scene in the balllroom was like a May day frolic. James McGovern ot Brooklyn and Mrs. J. Sanford Saltus, John C. Furman, the Rev. Hugh O'Neill A.W. Manville, H.C. Merrill, Albert J. Athuus and family, Col. James C. Eadie, Mr. and Mrs. Frederick Grant, Mr. and Mrs. E.D. Crocker and daughter, R.G. Greg, D.C. Price, Jr., Miss M.T. Grant, Mr. and Mrs. Montary, Mr. and Mrs. E. Creger, Mrs. Dr. Fraenkel, sister and Miss Kessler, R.S. Monroe, Miss Clothilde Wortheimer, Miss Kaufman, H.T. Burroughs and Miss Adele Burroughs of New York; Prof. W.P. Mason and wife, Troy, N.Y, Mr. and Mrs. Nixon of Philadelphia; J.D. Fairchild, Woodsburg, L.I. ; J.C. Malcolm, Staten Island and T.J. White, Cedarhurst, N.J.